Sasha Malic has been involved in the ICT industry since 1989. He has a Bachelors Science degree in Information Systems and has completed various courses in the Business Continuity field. Currently his role at ContinuitySA since 2011 is as Solutions Architect, involved primarily in pre-sales consulting, solutions design and project implementation. Prior to joining Continuity SA, he was employed at IBM South Africa since 2001, where he worked in several roles mainly in Financial Services and Public sector accounts. Sasha worked in the IBM Business Continuity and Recovery Services (BCRS) division for six years. Prior to joining IBM, he owned a successful network consulting and IT outsourcing business. Cloud should be included in your backup strategy to reduce business risk, protect data and to improve recovery times in the event of an outage. 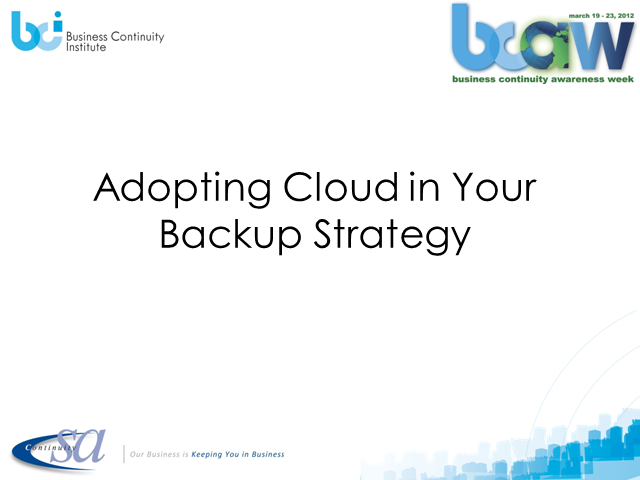 Various new technologies exist to enable a cloud backup methodology which will be discussed.